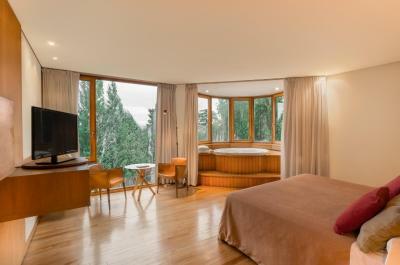 Lock in a great price for Design Suites Bariloche – rated 8.7 by recent guests! The size of the junior suites and their design, as well as the design of the common space made this one of my favorite hotels on this trip. I would definitely recommend it to others. Room was very spacious with a great view out over the lake. The welcome drink was a nice touch, and the bar/restaurant has a great view. Location was good with a short walk into the town. Overall a great good value hotel. Room with Jacuzzi had the best view and was very comfortable. Also, for the price, I guess it was really nice, and would be hard to find something like this in other countries. Nice big rooms. Upscale compared to other places in Argentina. Very kind and professional staff. The excelent view from the upper rooms. 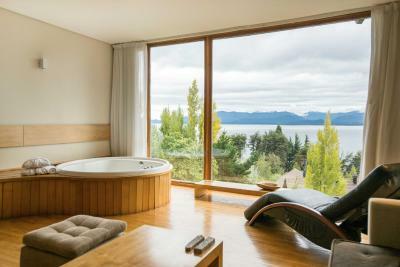 Jakuzi bathtub at the room and full size windows with panoramic view of the Nahuel Huapi lake. 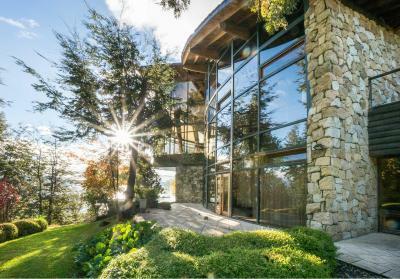 Large rooms with beautiful view! Convenient location. Comfortable beds and linens. Reasonably nice, nice restaurant, staff in the restaurant were really nice. Room was comfortable. Front-end staff/managers were less impressive. Walking distance to town. I'd stay here again, except we changed to Bosque de Nahuel once we got a car, which is awesome. 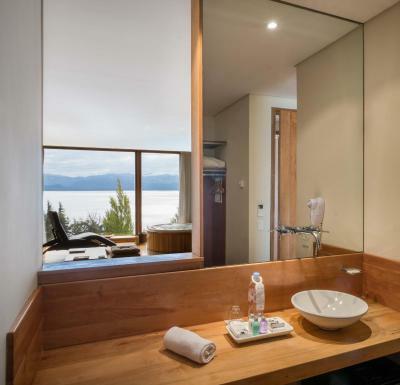 Design Suites Bariloche This rating is a reflection of how the property compares to the industry standard when it comes to price, facilities and services available. It's based on a self-evaluation by the property. Use this rating to help choose your stay! 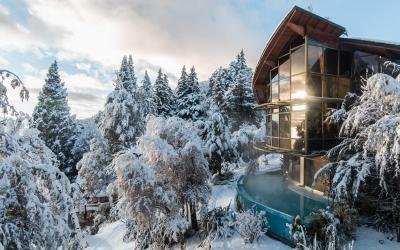 One of our top picks in San Carlos de Bariloche.Right in front of Nahuel Huapi Lake, Design Suites Bariloche offers rooms with lake or mountain views. A fitness center and an indoor/outdoor swimming pool are featured. 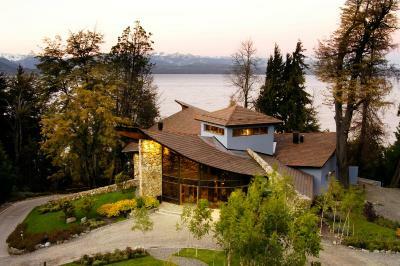 Bariloche’s Civic Center is 1.6 mi away. 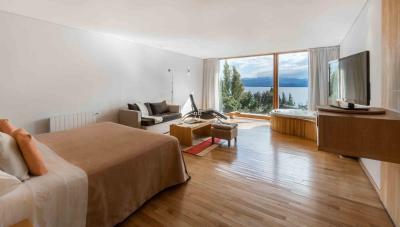 Boasting designer decor, rooms at Design Suites offer panoramic views of Nahual Huapi Lake. All of them feature Wi-Fi and private hot tubs. 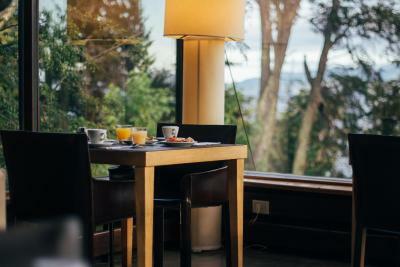 A buffet breakfast is served daily in the restaurant, and drinks from the bar can be enjoyed in the charming lounge, which features floor-to-ceiling windows. 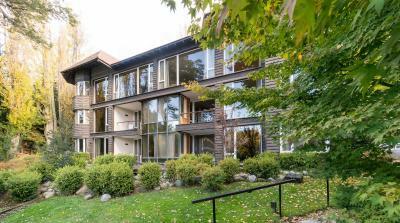 Facilities include a sauna, an outdoor pool, a heated pool, and a massage room. 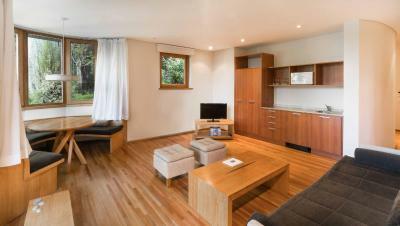 Design Suites Bariloche is 11 mi from Luis Candelaria Airport and 11 mi from Catedral Ski Center. Free parking is subject to availability. 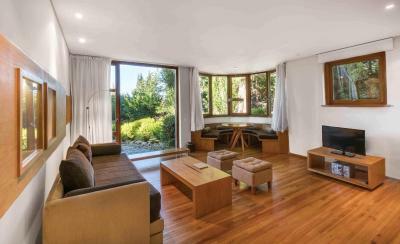 When would you like to stay at Design Suites Bariloche? 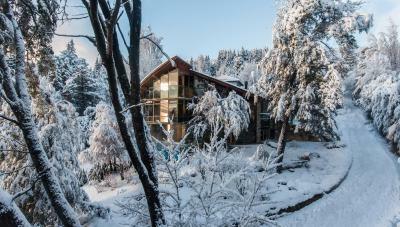 Features a TV, a mini-bar, and a private bathroom with a hydromassage tub. It may be fitted with a Queen size bed or 2 twin beds. This room does not accommodate an extra bed. Cribs are subject to availability. 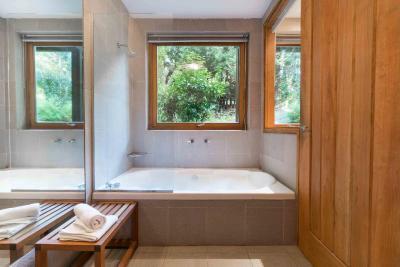 Features a spa bath, a flat-screen TV, a mini-bar and a work desk. It may be fitted with a Queen size bed or 2 single beds. 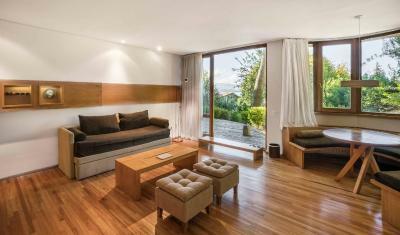 Features a private balcony, a spa bath, a flat-screen TV, a CD/radio player, a mini-bar, a sofa bed and a work desk. It may be fitted with a queen-size bed or 2 single beds. Up to 2 children under 12 years old or 1 adult can be accommodated in the room for free (except during July and August when charges might be applied). The sofa bed is recommended for children under 12 years old. Cribs are subject to availability. 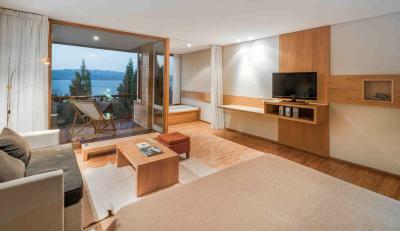 This double room features panoramic views of the lake, a flat-screen TV, a CD player, a chaise longue, a mini-bar, a sofa bed and a work desk. It may be fitted with a queen-size bed or 2 single beds. Up to 2 children under 12 years old or 1 adult can be accommodated in the room for free (except during July and August when charges might be applied). The sofa bed is recommended for children under 12 years old. Cribs are subject to availability. 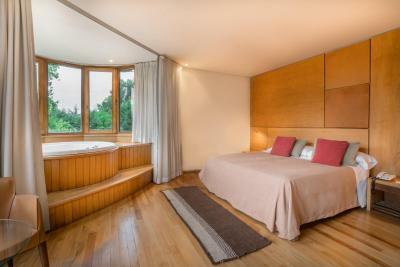 This spacious suite has a large bedroom and a separate room with a seating and a dining area. 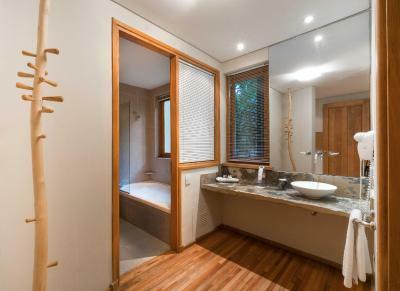 The suite also has a private bathroom with a hot tub. WiFi is free of charge. Up to 2 children under 12 years old or 1 adult can be accommodated in the room free of charge (except during July and August when charges might be applied). The sofa bed is recommended for children under 12 years old. Cribs are subject to availability. Located right in front of Nahuel Huapi Lake, and just two kilometers away from the center, the rooms invite us to contemplate and enjoy the best landscapes. 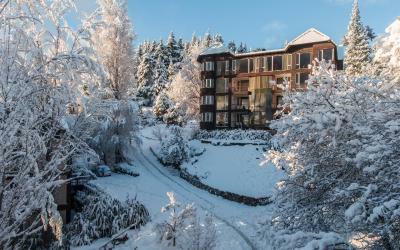 Each element in the hotel has been created to offer a unique atmosphere. 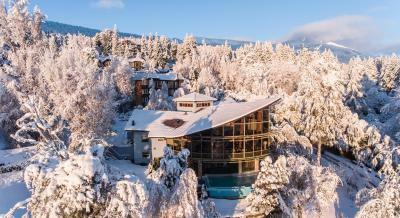 House Rules Design Suites Bariloche takes special requests – add in the next step! 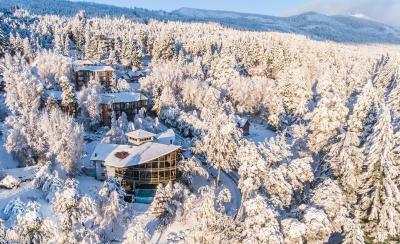 Design Suites Bariloche accepts these cards and reserves the right to temporarily hold an amount prior to arrival. Please note that a local Ecotax of 3 USD, per person, per day, is not included on the fee. It applies to all guests older than 14 years old, and can only amount to the charge of a 3-night stay. Please contact the property for further information. Please note that the shuttle service to Teniente Luis Candelaria International Airport signifies a surcharge of USD 33, and is made in a vehicle for 3 passengers and luggage. It takes approximately 40 minutes. Nonrefundable reservations are charged in advance, the VAT refund will be made to foreign guest when check in, if applicable. There’s not much of a chill area. They could make more of the beautiful outdoors in this weather (autumn). Not sure why but they gave us room 2001 which is ok but you’re on underground/ground floor but it’d be nice if we had chairs to sit on the deck behind the room. Unfortunately it is only 1 bathroom (we were 3 women); which is a bit of a shame considering the rooms are huge and there are usually more than just couples staying there. The grounds are pretty and the location is lovely right across the lake. The fitness room is tiny and could use an upgrade of weight equipment but I’m glad they had something! Wifi access could have been a little faster, but this a very picky point. Didn't stop us doing anything. 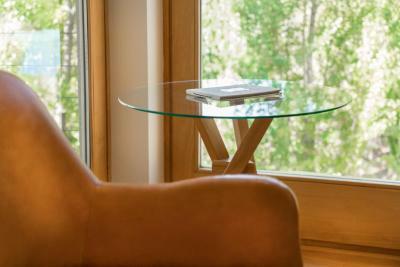 We loved our time at Design Suites. 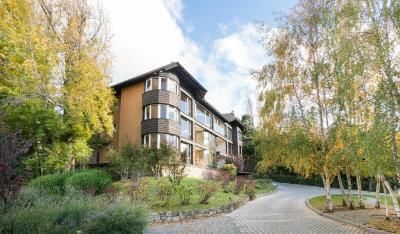 Located in a hillside forest/garden with great views of the lake, it was quiet with no traffic noise and lots of birds. Walking back and forth (up and down) to breakfast was a great start of the day. After dealing with traffic on Avenida Bustillo and trying to find parking in Bariloche, we decided to enjoy the sunset and great view from restaurant on site. Since we had car for local touring, we didn't utilize hotel shuttle for trips to town or airport. The staff at the front desk were helpful but not as personable as the wait staff at the restaurant. the restaurant staff were incredible. Such friendly folks who really made our stay. As the property starts feeling its "age" u can see some little defects in the fixtures tht are mostly wood and suffer for example the humidity generated by the Jacuzzi in the room. 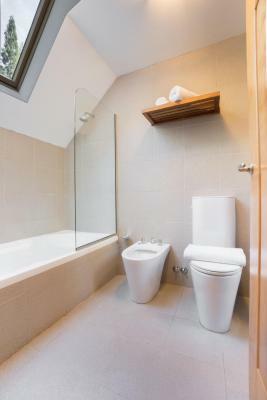 Overall though maintenance is very good and keeps everything clean and tidy. The view from the room with the jacuzzi facing the lake is just stunning. Moreover kudos to the tour agency organizer, Fernanda, that was extremely helpful to suggest us all tours and arranged a perfect car rental at the property at a great price. Much appreciated service. The whole place was just fairly run down and beat up. It needs some renovations to modernize it. 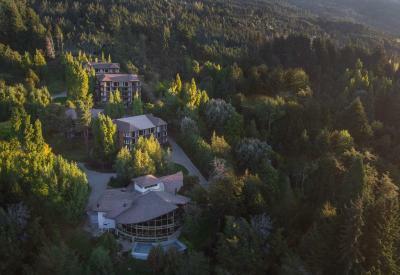 Is more a big chain hotel type more than a Boutique hotel. I didn’t like much the breakfast. You need a car to move around. 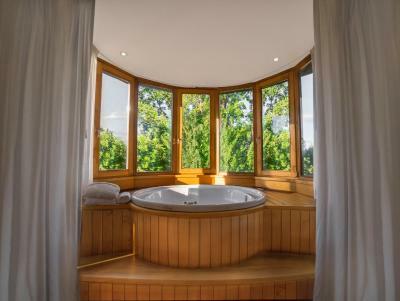 The view of the room is incredible with a great jacuzzi. It is a huge room. It is a small walk to the center, but it is close to a road. We were promissed a room with a view, but we looked at the parking lot. The room was really big and the bed was comfortable. We also had dinner in the restaurant, which was amazing. Liked everything about the hotel; we could not believe the value for money. 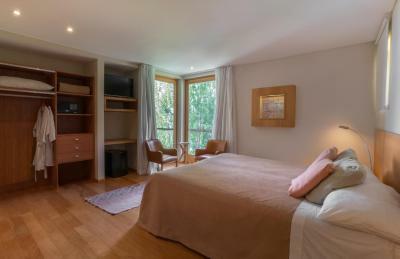 The room was immaculte, comfortable and spacious. The restaurant was excellent (not to mention the views! ), the staff were absolutely top class and the views were amazing.